A newly opened store, this one doesn't even have a name yet! Once you set foot in the shop though, Abdul Rahman, the kindly old owner, will run you through all the different options, and will even recommend something for your outfit and budget. Whether you want pretty jhumkas and studs starting from INR 50 or heavy choker necklace sets priced at INR 2,000 upwards, there's no dearth of options to choose from. Just make sure to sift and sieve, and bargain a lot! If you're into semi-precious beadwork and stone jewellery, MU Motiwala is the place to go to. We spotted onyx, pearls, rudraksh, topaz and, coral in different shapes and sizes. The prices are fixed, and they have a separate section where you can buy ready-to-wear options. Otherwise, you can just buy the stones and beads and get them strung to make your own custom jewellery. Looking to deck up for an upcoming event? Prasad Novelites beckons with its stunning collection of haath phools, naths, kadhas, chandbali earrings and temple motif sets, starting from INR 1,250 upwards. If you're looking for something simpler (or cheaper), pick up some of their lovely jhumkas, priced at INR 400 upwards. 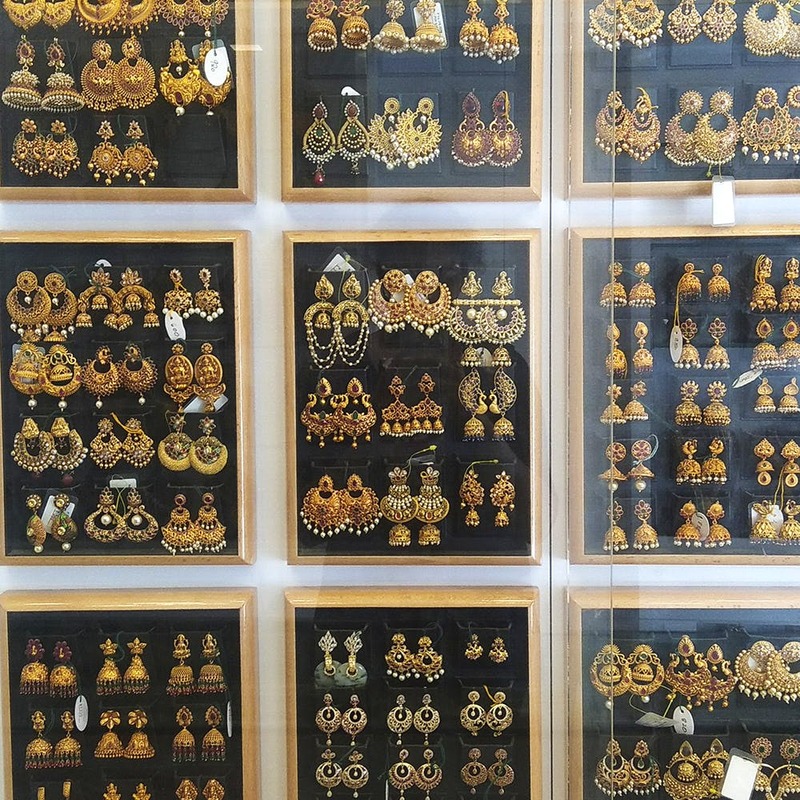 What sets this store apart is the fact that all their jewellery is made with 1 gram gold. Walk in here to find a whole range of wedding jewellery - from maang tikas, waistbands and necklace sets to kadhas, bracelets and toe rings. Prices are fixed, so you won't be able to bargain your way through. What's more, located right outside the shop, you'll find an independent beads-stringer who'll make custom pieces for you using artificial stones and metal beads. Want to stock up your jewellery box with silver and gold accessories of all kinds? Then, this place will prove to be paradise. Head over here to browse through glass cases with seemingly endless designs. For earrings, you can pick up some jhumkas with semi-precious stones, or go for the elaborate long earrings with colourful inlays. They even have a huge collection of necklaces, nose pins, bridal accessories, semi-precious stone and beadwork for you to choose from. P. S. They do nose piercings, too.